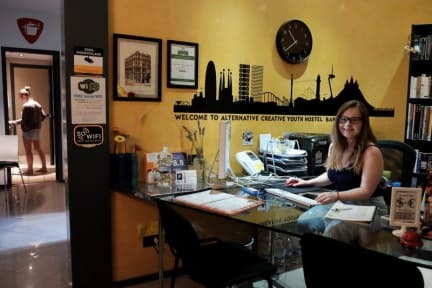 The hostel was created to offer safe accommodation especially to open-minded, adventurous travellers who come to Barcelona to experience the cities historic and artistic attractions. The Alternative Creative Youth Hostel is a friendly and cozy place where you can easily make friends with people from all over the world. Please note that we are a FUN but not a PARTY hostel. We love to provide accommodation to people who come to Barcelona for a culture and leisure visit but not to those who plan to get wasted every night. We respect you and in exchange expect respect from you - towards your roommates, the staff and yourself! We do not want drunkards to spoil the atmosphere. ... and most importantly a great relaxed atmosphere with other young travellers from around the world. DIRECTIONS: There is no hostel sign in the street. Look up high for house number 17. 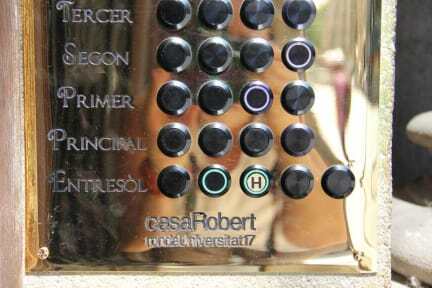 When you found it, ring one of the GREEN bells with the “H”. This hostel is located in the middle of the city center, so you can walk almost everywhere from the hostel. The staff is very helpful and friendly. I read in the reviews that the atmosphere was really good, but when I was staying there, there were mostly couples and people that were just minding their own business. But besides from that, it is a nice hostel.